Moose, elk and deer males are feeling a little light-headed these days. The bucks and bulls are shedding their antlers to make room for new and maybe larger racks by next fall to help gauge their breeding prowess. 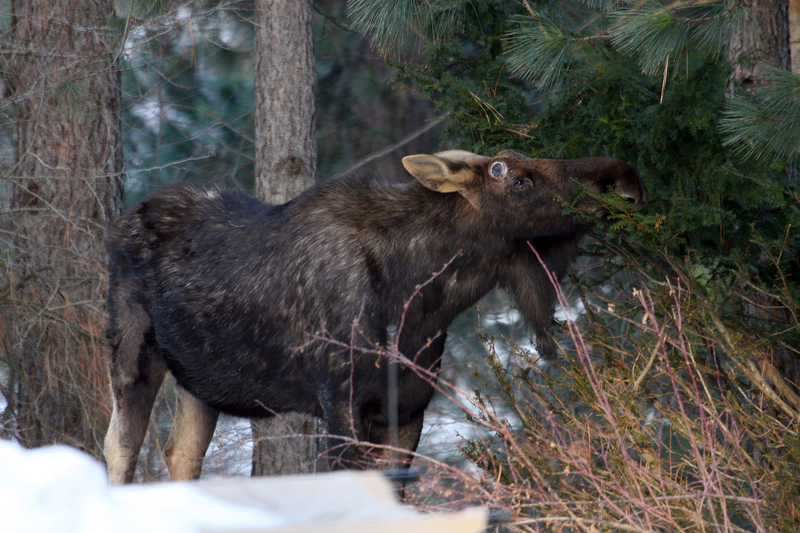 The timing is good for a moose spotted in the Liberty Lake area in January with a string of Christmas lights tangled in his antlers. “We knew he would be shedding the antlers soon, so we just left him alone,” said Madonna Luers, Washington Fish and Wildlife Department spokeswoman. Howard Ferguson, department wildlife biologist, said deer tend to be the first to drop their antlers. “Probably half or more of them have lost their antlers by this week,” he said. Moose antlers are starting to drop regularly now, although Ferguson said he saw a bull that had dropped one side during his Jan. 3-4 aerial big-game survey. “We time the survey in early January because we know that by Jan. 15 there’s a high probability that some bulls will have lost both antlers and be hard to distinguish from cows from the air,” he said. Elk tend to shed a little later, peaking in March. Antlers are temporary projections of bone grown and shed each year. New growth will start in March or April as increased daylight triggers testosterone production. Wildlife biologists say antlers are the fastest growing tissue in any mammal. Deer or elk antlers can grow an inch a day. A big Alaska bull moose can grow an 80-pound rack in a summer, adding a pound of bone a day during peak growth. Genetics has an influence on antler growth and size, but nutrition is the most important factor, Ferguson said. The time required from start to finish of antler growth can be as short as 90 days for spike bull elk (usually yearlings), gradually increasing with age up to a maximum of 140 days for a trophy-class bull that’s usually 7 years or older. A mature elk’s antlers can grow to 30-40 pounds. So you can only imagine the relief they feel when the antlers shed. People have long enjoyed collecting shed antlers to craft into displays, jewelry, tools as well as for folk medicines. “They used to go out in April or May, but as shed hunting has become more popular, more and more people are going out earlier, to the point that it’s become a factor in the survival of the elk,” said Pat Fowler, Washington’s wildlife biologist for the Blue Mountains. “Most elk won’t start dropping antlers until late February or March, but we have guys who are out there watching them already. The shed hunters run those hillsides every day and that tends to break up the bull groups, reducing their security, and send them into the deeper snow on the north slopes when they should be down lower where they can expend less energy and find more food.